Denise Bean-Raymond is available for clinics, demonstrations and lectures at your facility, event, school, expo or horse show. 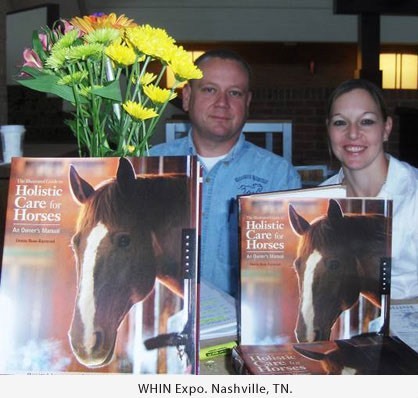 She is happy to share her knowledge regarding equine massage therapy, equine acupressure therapy and equine nutrition with you. She is known for her clear communication skills, patient teaching abilities and absolute thoroughness. She offers these services locally, as well as internationally. She tailors each clinic according to the attending audience, hosting facility and requested topic. Equine Affaire (West Springfield, MA). Advance booking is highly recommended for all clinic/ lecture/demonstration requests. Fees are assessed for each individual speaking engagement. Visit the Events page for a list of upcoming clinics, lectures and demonstrations. Contact Denise to schedule an event in your local area. Read below to see what several notable individuals had to say concerning Denise's clinics/lectures and demonstrations. "Sunday's 2012 clinic with Denise Bean-Raymond was just as informative and dynamic as her first visit to the farm last year. For this visit Denise concentrated on the 3 pressure points in the neck as well as the 5 found in the stifle. She explained in detail how any deviation from the proper position of the neck, head and stifle will cause tension & tightness at these points. Denise then demonstrated direct pressure and cross fiber friction, when to use each and how much of each was needed to soften the tight knots. Each attendee had a horse that they could practice these techniques on....it was hard work, but many of us saw results with our horses immediately! Denise now has a new DVD available that explains these massage techniques as well as her excellent equine massage book. If you are interested in purchasing either or both sources of information, just visit her website: www.ExclusiveEquestrianServices.com. I love her book and I just got the DVD, which I cannot wait to watch. Thank you to everybody that came to the clinic and helped to make it such a successful day! " Thank you for delivering your presentation at the 2011 Eighth Annual International Association of Animal Massage and Bodywork Educational Conference! Thank you for taking the time and effort to prepare your presentation, travel to Toledo and participate in the conference. We speak for everyone who attended in expressing our gratitude for your genuine presence and willingness to share your expertise with our community. Your personal involvement made this event a success. Thank you again for sharing your expertise with us! The Women's Horse Industry Global Network presents you with this certificate of appreciation for participating as a speaker at the 2011 Annual Global Business Networking Expo. in Nashville, Tennessee. Thanks so much for your support!! We were excited to have someone with your background and expertise at this event. With the 2009 Equine Affaire in West Springfield, Massachusetts now behind us, I wanted to take a moment to thank you for joining us. The event was a great success and I thank you for all of your contributions as a presenter. Your presentations were very well received. I wish you continued success in the coming months and look forward to working with you again at a future Equine Affaire. Thanks again!! Thank you so much for your participation as a speaker in the Connecticut Horse Symposium. Many people enjoyed your demonstrations. Your participation helped to make this event a success. Once again, thanks for your help with this event and I hope to work with you again in the future! 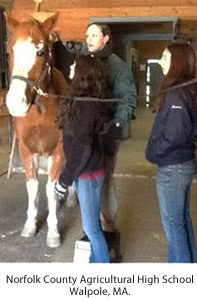 The Equine Massage Therapy clinic that was held today at Hope Valley was phenomenal. Denise Bean-Raymond from Exclusive Equestrian Services did a super job of explaining what massage therapy is and is not. She explained why each horse from the very young to the very old would benefit from it and how we may play an active part in keeping our equine partners functioning at their best. Using Tigger as her model, Denise gave the group a demonstration of several key areas that may be massaged before and after riding our horses. Starting from Tigger’s head and moving towards his hind-end, she described the type of movement or lameness you would expect to see in relation to each site. Denise also explained the different types of pressure that one would use to help break-up any muscle tension found, explaining the importance of us breathing and staying relaxed while we performed the massage. She also described the responses the horse would exhibit during the massage and true to her word, Tigger responded on cue. The 2nd half of the clinic involved hands-on for everybody. The ponies were all brought into the round pen and everybody had a chance to practice finding tight spots on their horse and trying the massage techniques to help soften them. When tight spots were found it was amazing to see the horse’s response to the massage. 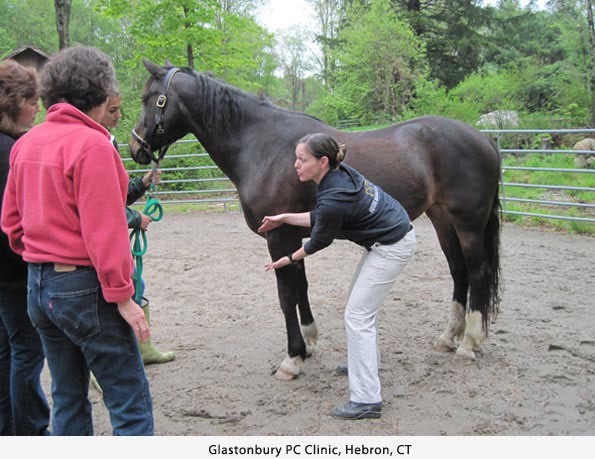 In some instances we even saw muscle tremors, which helped us understand exactly how much congestion was in a particular muscle and “the why” that a particular horse moved the way it did because of it. The session was so worthwhile. Denise’s passion for her work shines through with her instruction and the attention that she gave each of us. I am going see if Denise might do another clinic with us this fall so that those of you that were unable to attend today might be able to do so at a later date.